Paper Monuments Project #002: The New Orleans chapter of the Black Panther Party and multiple branches of law enforcement within the Desire housing projects in the city’s Ninth Ward engaged in one of America’s largest standoffs. On September 15, 1970, one of America’s largest standoffs took place between the New Orleans chapter of the Black Panther Party and multiple branches of law enforcement within the Desire housing projects in the city’s Ninth Ward. Leading up to the standoff, then Governor John J. McKeithen vowed publicly not to allow a Panther foothold in “his state”. Completely unwavered by the Governor’s threat, the Panthers were holding political education classes, running breakfast programs, and provided free sickle cell screenings for the community. The local government, however, seemed to have other plans for the black residents, and self-empowerment was not one of them. At around 8:30 a.m. on the morning of the shootout, over one hundred New Orleans policemen, State Troopers, and Orleans Parish Sheriff’s deputies arrived in busloads, armored cars, and police cruisers. Armed with high powered assault rifles, shotguns, and side arms, the unified law enforcement surrounded the Black Panther Headquarters and opened fire on the building for well over twenty minutes NONSTOP - without regard for the women and children held up inside the building. Over thirty thousand rounds of ammunition were sprayed into the Headquarters that morning. Amazingly, not ONE of the twelve men, women, and children inside the headquarters were harmed. 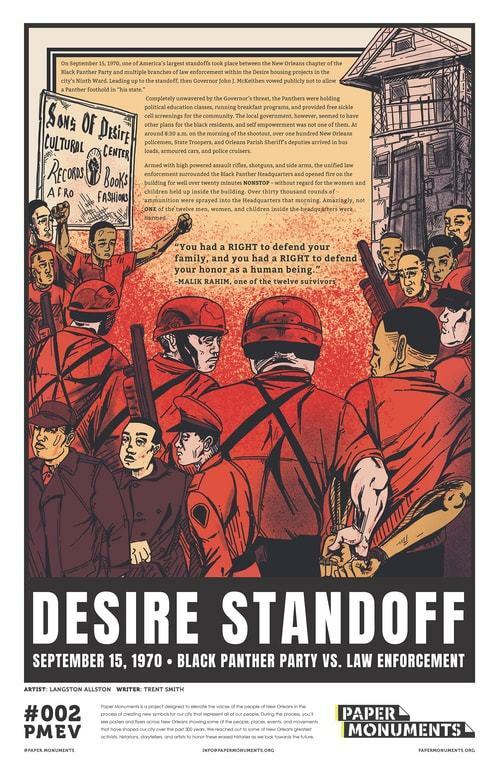 Paper Monuments, Trent Smith, narrative, and Langston Allston, artwork, “Desire Standoff,” New Orleans Historical, accessed April 24, 2019, https://neworleanshistorical.org/items/show/1428.